Iquito’s newest venture in deluxe jungle lodges, the Treehouse Lodge is the only hotel in Peru that allows you to complete your jungle stay in an elevated tree house with the possibility of glimpsing the elusive Pink River Dolphin from your front door! 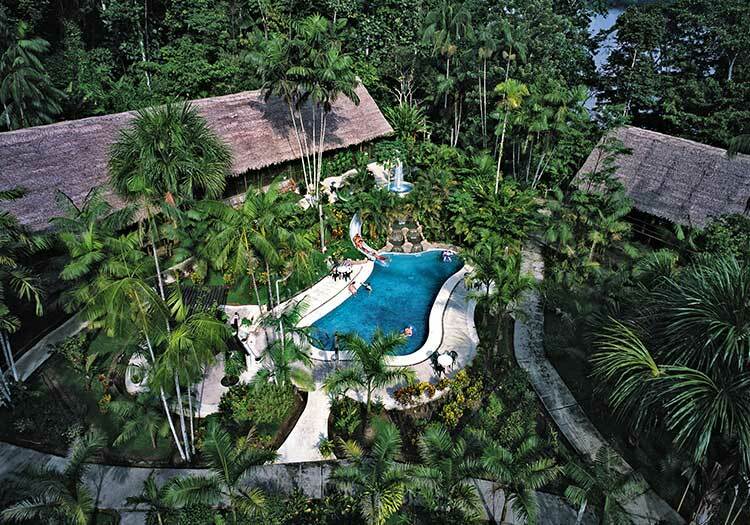 The Treehouse Lodge is a brand-new endeavor situated just a few hours up the river from the jungle port city Iquitos. Located close to the mysterious waters of the Yarapa River, the Treehouse Lodge is constructed in such a way that the grounds are partly flooded during the rainy season. Never fear, however, for you won’t have to get your feet wet if you don’t want to – each and every one of the Treehouse bungalows are elevated in the canopy, connected by a network of wooden and steel cable bridges. Live out the age-old daydream of sleeping under the stars in a bonafide tree house, and share the experience with the exotic wildlife that roams outside your front door. Offering eight unique bungalows, the Treehouse Lodge gives you the opportunity to explore the expanse of lodge property via the spider web of connected bridges below each bungalow. Enjoy delicious meals in the two-story restaurant and common lobby, relax near the cooling fans generated by solar power, and make time for out-of-this-world excursions piranha fishing and bird watching. A unique Amazon Rainforest experience with Treehouse Lodges awaits!